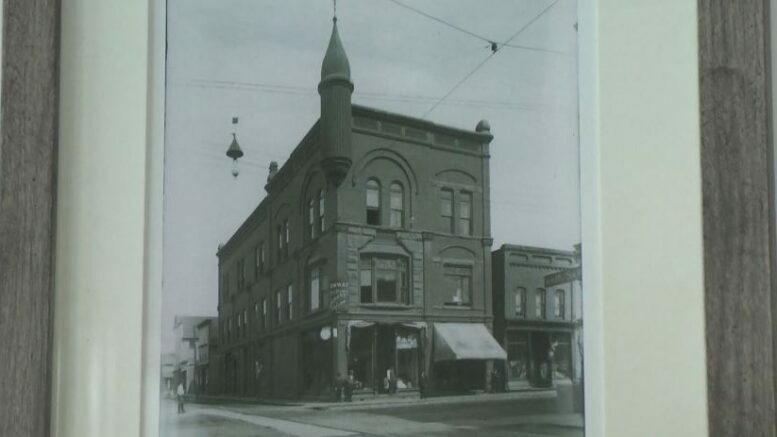 ISHPEMING–The old Historic Anderson Building in downtown Ishpeming is currently in the process of planning renovations, and on Tuesday evening, tours were held for the public to explore what options the building space could provide. Under newly acquired ownership by West Ishpeming Sands LLC, proposed renderings have been produced in which the 1st floor would become a space for retail and coffee shops, and the second and third floors would act as office and apartment spaces as the best options for the public become more clear. An elevator would be installed in the proposed renovation as well, to provide easy access to all floors. Another exciting idea is to reinstate the iconic turret and weather vane. Built in 1891, the building is a 12,000 square foot late Victorian complex. “It’s really exciting because we’ve put a lot of work in so far, and it hasn’t shown much – we haven’t had many people come to the building or show much interest, but tonight with how many people are just here right now, it’s really exciting,” said project marketing coordinator Anthony Moyle. The company is still actively seeking business tenants for the building, and anyone interested can contact the building owners.